The struggle for a nonracial South Africa began in the early 1900s and continues to this day. The diverse people of our country will know neither peace nor broad prosperity until that ideal is achieved. Our historic agreement of 1994 was that South Africa belongs to all who live in it. 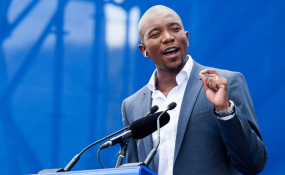 The DA's project is to promote that vision and continue the struggle for a nonracial South Africa. Our rich diversity is part of what makes this country so fascinating and beautiful. We should embrace it. Acknowledging diversity doesn't make you a racist. On the contrary, it is the first step to embracing it. Apartheid will only be truly defeated when only one race remains: the human race. To find each other, we must be willing to ask difficult questions and have frank conversations. That's why the DA does not shy away from robust, open debate. You can only draw people near when you reach out. It is worth the effort a millions times over, because we are all better together. Our key political opponents thrive on racial division. Their objective in doing so is to win votes, not to build a prosperous, successful, peaceful country. For the ANC and EFF, racial propaganda is a powerful mechanism to "divide and conquer". For the ANC, it is their last remaining way to shore up their waning support, which is ebbing away on a tide of corruption and poor governance. This is electoral populism. It has nothing to do with bringing people together or helping to solve their problems. Ahead of the 2014 national election, Cyril Ramaphosa urged disgruntled Limpopo residents to vote, saying: "If you don't vote the Boers will come back to control us". In 2016, Julius Malema said: "We are not calling for the slaughtering of white people, at least for now." Last year, he said: "Indian people are worse than Afrikaners. This is not an anti-Indian statement, it's the truth." For five Cape Town councilors, the DA wasn't a racist party last month. But now that they've been shown to be the most ardent defenders of maladministration, despite evidence which has now been confirmed by a credible forensic investigation, the DA is suddenly a racist party. These five councilors have resigned, claiming racial victimhood. Can it be coincidence that they have suddenly decided the DA is racist? The real VBS issue is that politically connected individuals stole R2 billion from poor people through banking fraud. The manufactured issue to deflect from this real issue is that "black people can't run a bank". In this case, the author of the VBS report, Terry Motau, is black, so he and his report can't be discredited on the basis of being racist. The moral and economic imperative to transform South Africa's banking sector is undermined when people use race as an excuse for looting. Corruption is a cancer destroying our body politic. Accountability is the only cure. We must not allow racial mobilization to undermine our fight for accountability. In Tshwane, the city manager is using the same tactic to avoid accountability, claiming victimhood and calling an audit report 'bogus' because it finds against him. Are we to conclude that an institution cannot be credible if it finds against a particular race? If we fall prey to this dynamic of false racial victimisation, then all processes become flawed and our 1994 social contract becomes untenable. Then we'll need courts for black people and courts for white people, auditing firms for black people and auditing firms for white people and so on. The media sensation after yesterday's council meeting was extraordinary. Five out of 154 DA councilors (and out of 2000 DA public reps) resign and suddenly "the DA is imploding". This is nonsense. But the media has bought into this false narrative. The DA is laying the foundations for a strong party within a mature democracy. It is a real challenge to build a nonracial South Africa but we have to fight on. One South Africa for all is the DA's historic mission. We stand on the shoulders of giants who came before us and fought this worthy fight. We dare not fail. Copyright © 2018 Democratic Alliance. All rights reserved. Distributed by AllAfrica Global Media (allAfrica.com). To contact the copyright holder directly for corrections — or for permission to republish or make other authorized use of this material, click here.